This large cabin has a nice view from its covered porch where you can sit out and watch the children play in the lawn below or have an evening barbecue in the shade. It has wood throughout and the open floor plan combines the kitchen with the living room. This cabin is very cozy with its gas stove and beautiful furnishings. This cabin is great for the whole family, including the pets! It is also WHEELCHAIR ACCESSIBLE throughout the cabin, including in the living room, bedrooms, and bathroom! This cabin is in a great location that is close to the lake, the Wallowa Lake Tram, and much more! 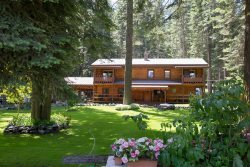 It is located on the Wallowa Lake Resort site and is near cabins 1-11, so several families could come stay in the same area! Come stay at this family friendly cabin at Wallowa Lake!